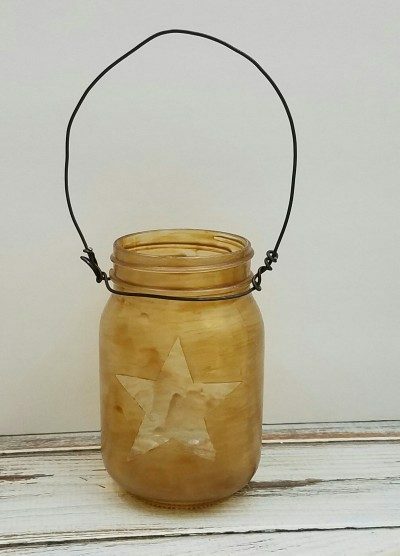 If I can bring new life into something that normally goes into the landfill or recycle bin then that’s what I will do, like this Primitive Lantern made from a pasta jar. 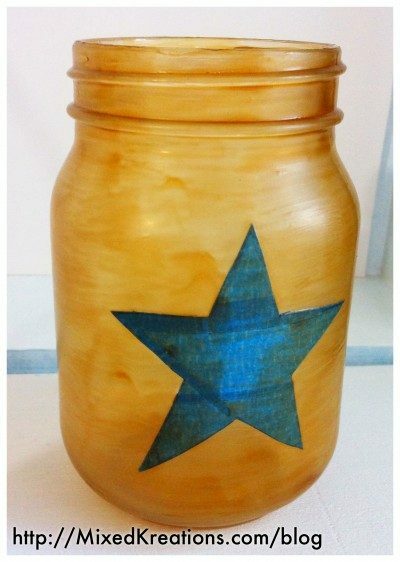 This is just one of many of my Repurposed jar projects. You can find the material list for this project at the bottom of this post. 1. 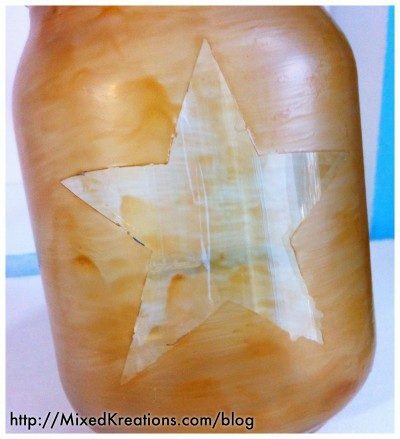 To make a primitive lantern first start with a clean jar, then tape off one side of the jar with the painters tape placing the tape edges together and making it just a little larger then you want your star. 2. 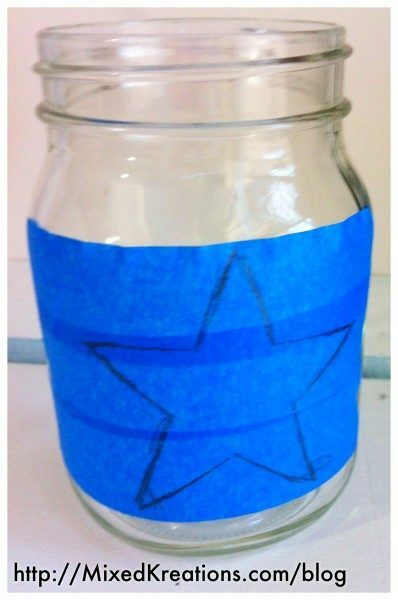 Draw your star onto the tape. 3. Using your X-acto knife cut the star out, and peel the excess tape off leaving the star in tack. 4. 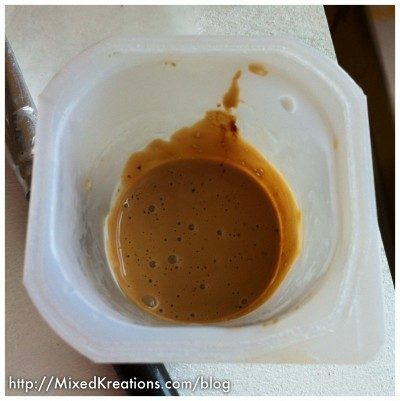 Pour about 1/4 cup of mod podge in a disposable container and add about 1 teaspoon of instant coffee grandules, and mix. 5. 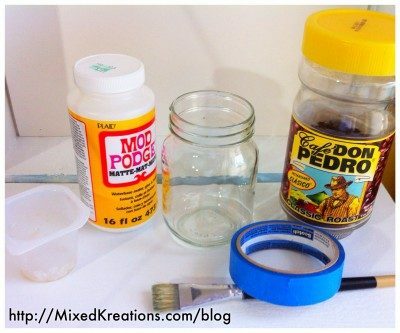 Paint your jar completely with the coffee and mod podge mixture. 6. Let dry throughly, then gently peel the painters tape off. 7. Use your X-acto knife to straighten up any rough edges. 8. Add your wire for hanging, and a battery operated LED tealight to your Primitive Lantern and that’s it! I am sorry that I forgot to get a picture with the tealight inside. If it’s still at my booth next time I go I will try to remember to get a picture. 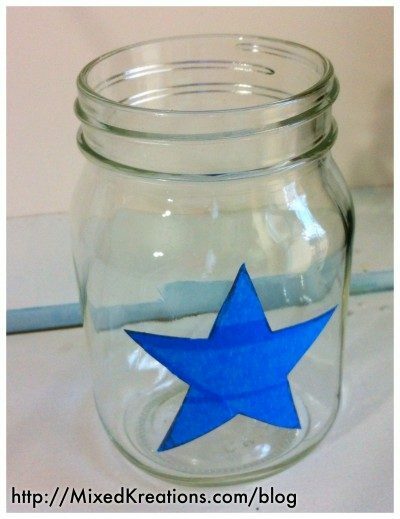 Have you repurposed any jars into lanterns lately? I would love to see them. Leave a comment below with a link so that I can go check it out. 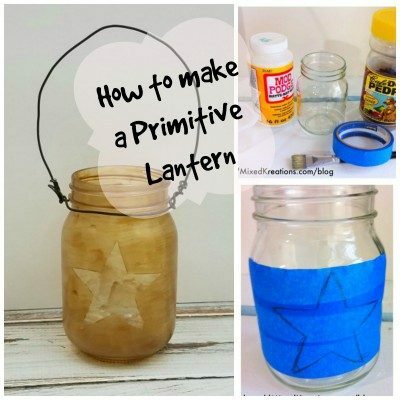 This lantern sounds like a fun and easy craft. Thanks for including the step by photos. Thanks! It is so easy, anyone could make it. Thanks for stopping by! Linda I love this idea. Your lantern is full of rustic goodness. I am definitely going to have to try the mod podge idea with coffee. Pinning! Thanks Mary! I love my mod podge, I just can’t believe it took so long to discover it. You can add a little bit of coffee or a lot to get it the desired shade your looking for. Wow, I would never have thought of using coffee and mod podge. It gives it such a lovely old world look. Beautiful!! Thank you Michelle! I use coffee to age paper and fabric so I thought why not try it in mod podge and see if it will give the same aged look. You are absolutely the queen of repurposed Mason Jars! Love this lantern…I can imagine how pretty it will look with a lit votive in it during the evening hours. And I love how you made your own stain with coffee and modge podge…not surprised though. It seems your creativity knows no bounds. Thank you Lynn! I just got lucky when trying this, because I wasn’t sure how it would work. I can say the same about your creativity Lynn! Hope you have a Happy Fourth of July! Thanks Jessica! I was sure how it was going to turn out when I decided to give it a try. But was very happy how it turned out. Thanks Sarah! I have used it for aging fabric as well as paper. And mixing with mod podge works well too!